God has wired us to be interdependent with each other while being completely dependent on Him. He uses people to assist us in our life journeys. We need one another to survive. We need one another to be fruitful. We are the body of Christ. The Word explains how we need to work together by likening us to a physical body. The hand can’t say to the foot, “I have no need of you” because every part in the body is necessary. This principle of connection is the essence of what took place in the garden. Adam needed to be connected to another human to complete the assignments God gave him. Though the man walked and talked in the cool of the evening with God, Adam needed to be joined to someone of his kind to be more fruitful in life. Excerpt From: Michelle McKinney Hammond. 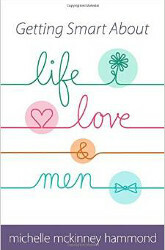 “Getting Smart About Life, Love, and Men.” Harvest House Publishers.